Above: Photograph by Jennifer Coats. DENNIS KINTIGH HAS NO REGRETS. 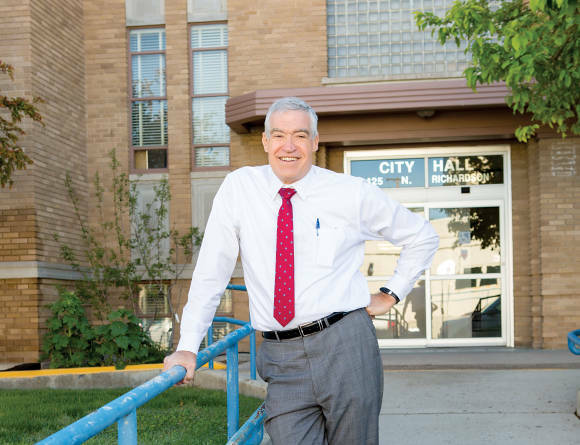 The Ohio native has an eclectic résumé: FBI special agent, New Mexico state representative, Air Force officer in the military and civilian space programs, police chief, oil-field pumper. And, since 2014, the mayor of Roswell, having moved there in 1992, when he was assigned to a desk in a tiny FBI office, working a narcotics team. During his career in the Bureau, he was involved in some big cases, including the Pan Am Flight 103 bombing, but he’s most proud of the community and economic growth he’s developed in Roswell. For Kintigh, it’s all about progress for this town on the state’s southeastern plains. We’re a long way from anywhere else. We’re 200 miles from Albuquerque, Lubbock, or Las Cruces. I recently saw an article that, among cities of more than 25,000, we’re the sixth most remote city in the U.S. We are an island. So we have to provide all of the services to this community. That makes it more challenging and a lot more complex. Not everyone who disagrees with you is evil by any stretch of the imagination. They just disagree with you. You learn that today’s informant could be tomorrow’s defendant. Don’t take it personally. Someone gets upset with me, that’s fine. I’ve learned that you just go with the flow. Hey, I’ve been called worse things by more dangerous people. There are times I get frustrated, and you learn to not display it—at least I think I’m successful at that. You’ve got to work at it. We’re changing Roswell. We’re dealing with the things that have been kicked down the road for a long time and we’re not kicking them down the road anymore. We need to look at what our strengths are. One of Roswell’s greatest strengths that’s not well recognized is that we’re sitting on top of an unusual aquifer. We have all the water we need. The city has water rights to support a population of 250,000 to 300,000 people. What I really want are the boomerangs—they graduate from high school, go to college, go spend a few years somewhere else—I don’t care, that’s great—then come back. Bring with you what you have learned and experienced elsewhere in the world and help us invigorate this community. My youngest daughter is a boomerang. She brought her three children and husband—he’s a police officer in Roswell. They live a couple blocks from us. I’ve got three daughters and eight grandchildren and an awesome wife. And I’ve gotten to do lots of really interesting stuff. I’ve been fortunate. Everybody has friction in high school, in their early twenties … I got past that and was just starting to really connect with my dad when he died. I was only 27. Treasure that adult time with your parents, because the dynamics change. I enjoy my adult relationships with my adult children. Don’t eat so much dessert. Just about every day, I’ll get out and find something that’s being worked on. I love seeing stuff being created. Forward movement. It’s exciting. Roswell hosts the Eastern New Mexico State Fair October 1–6.